Interestingly, they have a lot in common in the destiny. First, both were children of masters, and both achieved everything in the life by themselves, having no noble family or a lot of money. Second, both were engaged in all areas of work, known at the time. 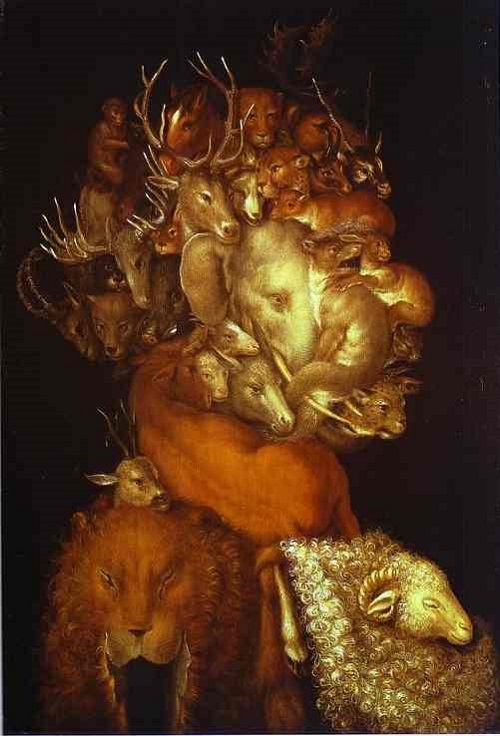 Third, Da Vinci and Arcimboldo designed all sorts of useful and necessary equipment, including military equipment. Besides, both of these famous Italian masters actively worked in the arts. And after the death of both, they were forgotten for almost a hundred years. However, about Leonardo Da Vinci remembered much earlier than about Arcimboldo, and the name of Arcimboldo, great artist and inventor of the era of Renaissance hardly anyone knows. 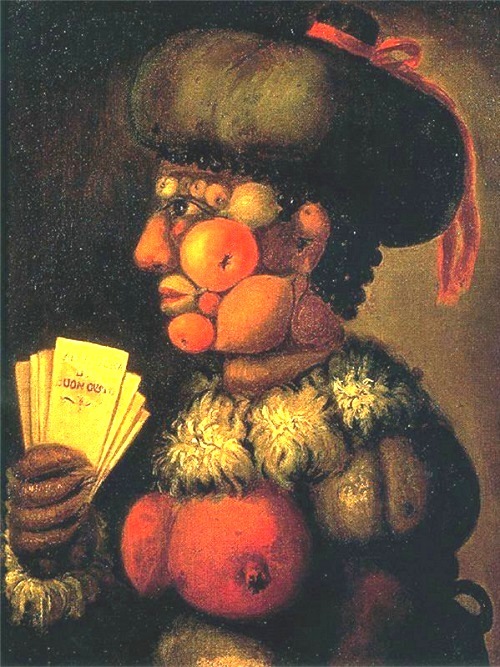 However, contemporaries evaluated the oddity of his paintings as curiosities, jokes, and shifters, cheering the imperial court, like the magnificent ceremony, fireworks and water views at the Imperial Palace, organized by master Arcimboldo. In modern language, he can be called the art director of the imperial court, but first and foremost he was still an artist, and as the artist he entered the history of European painting. His unusual paintings were admired not only by the Holy Roman Emperor, who loved to bestow his friends and enemies, but still surprise the artists of such a distant twenty-first century. Salvador Dali called him the first artist who was at the forefront of surrealism, coming to the delight of the well-known series “Seasons” and “Elements”. At some point there was a revolution in the style of the artist, no one learns about his life as not much is known. But Giuseppe started as quite a traditional artist, worked in the mainstream of medieval temple art. 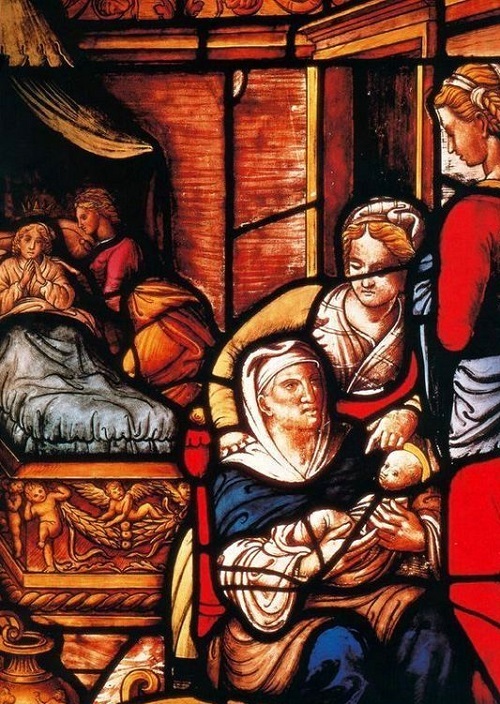 Together with his father, he decorated with stained-glass windows Milan Cathedral depicting the life of St. Catherine. 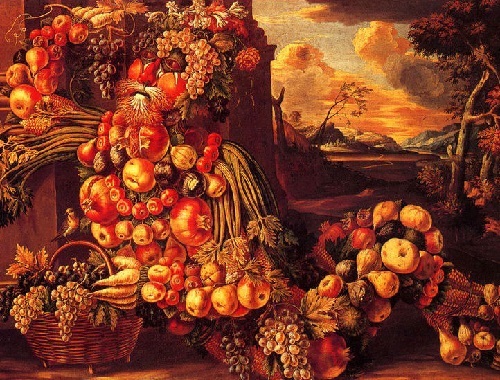 From this period, Arcimboldo gained love of bright colors. After the stained glass was a short period of manufacture designs for tapestries, which were also carried out in a completely traditional style. The turning point came after the invitation of Ferdinand I of his already well-known artist to the imperial palace in Prague. By the time he was thirty-five years old. Thus began a long twenty-five service as an Imperial court painter. 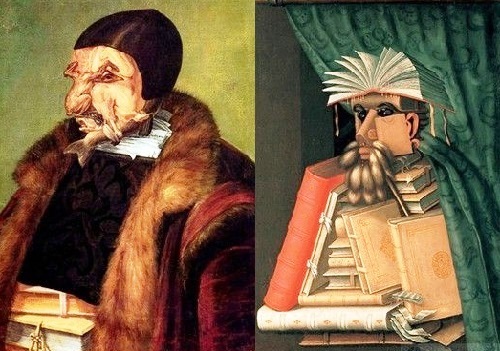 There Arcimboldo falls into a completely different environment in which worshiped science, scientists, magicians, astrologers, valued books and museums with the best works of art created by famous curiosities with bizarre animals and all entertaining, collected from all over the world. Perhaps it was then that he became acquainted with the paintings of Bosch, Breughel and Cranach, who had a huge impact on change of his style. 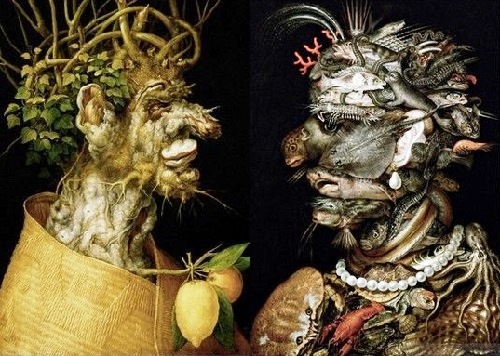 One year later, Giuseppe Arcimboldo created first paintings in which no one would have known the artist since the Milan Cathedral. They were pictures of the series “Seasons”, “Summer” and “Winter”. Later, to a series of paintings added “Spring” and “Autumn”. The pictures amazed and pleased the emperor so much that the artist was asked to paint the same as gifts to famous personages. So there are several paintings of this series, different from each other, but all performed in the same artistic concept and the same style. The series “Seasons”, and then the series “Elements”, “profession”, “Shifters” and pictures that are not included in the series, are unusual in that the elements presented in the form of people, but the people are unusual, composed of elements corresponding to ideas of the Renaissance – the nature, the four elements, the beautiful and the ugly. The elements that the artist sculpts in his images of the seasons and the elements, that affect by the diversity and subtlety of execution. 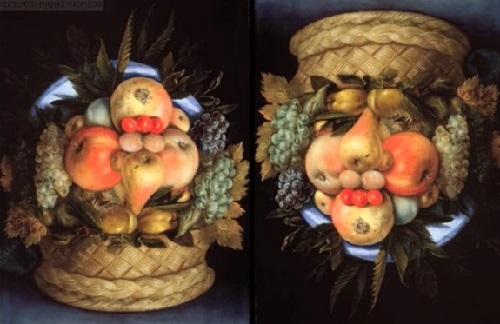 Scientists are trying to compile a complete list of marine animals, flowers, fruits, vegetables and birds, of which Arcimboldo created his whimsical images. In addition to the unusual material, of which he sculpts his characters, the artist builds in them the signs of imperial differences, glorifying the house of Habsburg and showing its strength and power. Art paintings by Giuseppe have a unique concept. 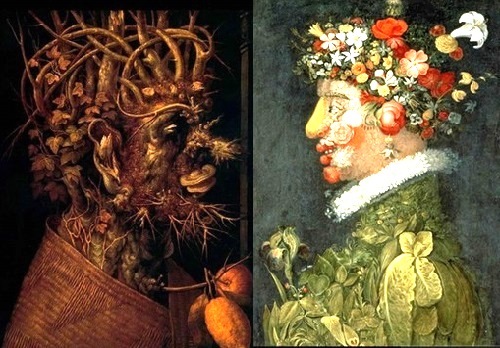 It laid the foundation of his success for many centuries to come, and documents of the time say the enthusiasm with which the monarchy and contemporaries spoke about the work of Arcimboldo. Look closely at his series “Seasons”, which is quite typical for the style of the artist. To understand the general concept of the series one should know that at the time, the countdown began from the winter and the year was divided into two halves – for two semesters. Accordingly, two adjacent seasons, make up one half of the year (winter – spring, summer and autumn), turned profiles to each other. And together they are – a whole. Two seasons, belonging to different halves of the year, painted by the artist turn their backs to each other: spring – summer; autumn – winter: spring finished the winter and autumn – the summer. 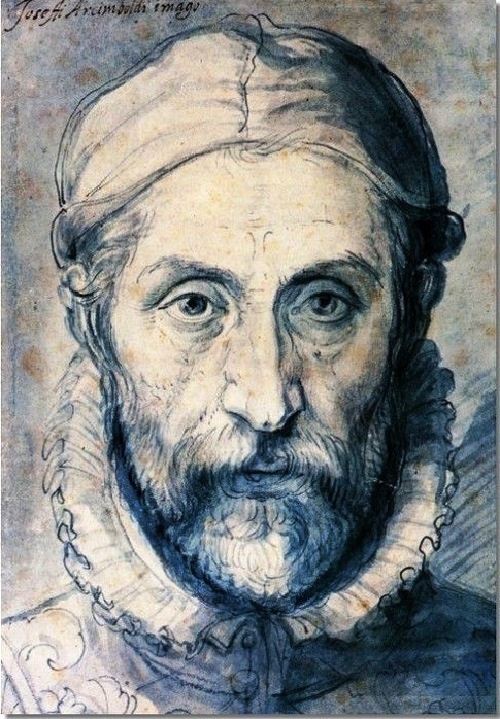 As a man of the Renaissance, Arcimboldo was not only an artist but also a scientist, engineer, inventor, architect and set designer, which was clearly demonstrated in his whimsical paintings. “Winter” was allegorically depicted as old rotten stump with cracks crust, which in some places have already disappeared. Stump looks like a pitiful, little old man living. His nose is broken, swollen and scaly, toothless mouth – mushroom – crooked chin studded with warts. All face covered with stubble, scars and scabs, small eyes deeply hidden in bark cracks. As ear – the mote of a broken branch. The old man is freezing cold and he is protected by the straw mat. But that winter – it’s not forever, say two lemons – yellow and orange, contrasting with the dark background. They contribute to the atmosphere of a dull glimmer sunlight and heat. The symbol of the coming spring – green leaves of ivy growing on the back of the head of the old man, and a tangle of twisted vines overhead, resembling a crown. On the mat coat of arms can be seen as a sign that the painting was commissioned by the emperor. “Spring” – the exact opposite of “Winter”: its profile deployed to the left, in contrast to the winter, which profile is deployed to the right. Spring – a riot of colors and a variety of colors that make up the head of a young girl with a gentle smile on her lips. She personifies the spring. 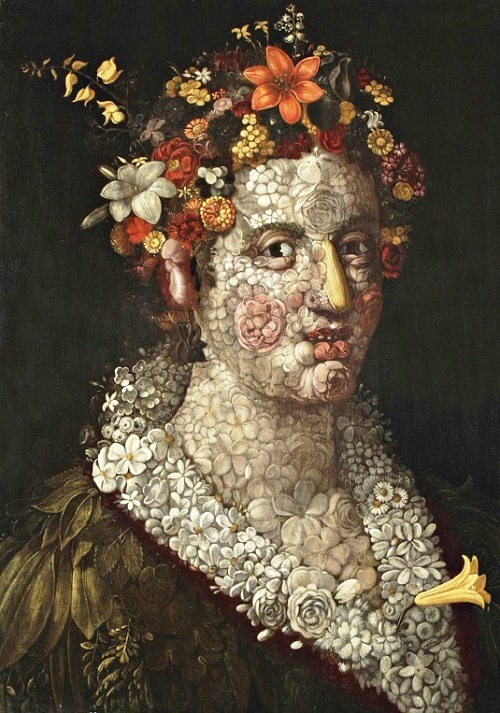 By the painting Arcimboldo manifests himself as a great expert on the flora. The skin, the hair, the dress is made up of delicate petals and stems of spring flowers made out to the smallest detail. Cheeks and skin of girl consist of white and pink buds, hair – a great hat from a variety of colorful flowers, the dress – of herbs and green colors. Nose – lily bud, ear – tulip, eyes – a pair of Solanaceae when they bloom, bright pink lips and chin – flowers of roses. Neck collar decorated with white flowers. The whole way of breathing freshness, youth and fragrance. “Summer” opens the second half of the year. Year of entering into maturity, spring bloom of youth is over. With fruiting the artist depicts the image of a young woman, not composed of delicate spring flowers of summer, but fruits, vegetables and berries. Here’s another color scheme: pale white and pink spring gamma replaced saturated yellow, brown, red and orange, symbolizing the hot sun. Bright, luminous paint emphasizes dark background. 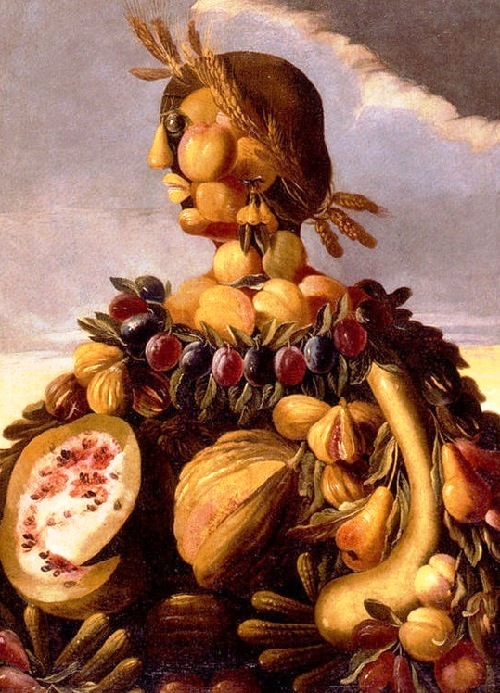 The cheeks of a young woman made up of delicate peach, nose – from zucchini, mouth – from the young pea pod, chin – red pears, pupil of the eye – from the bright cherry, earrings – garlic, and hairstyle – from grapes, olives, pears, wheat ears and other gifts of the summer, and a dress woven from ears of corn. In one embodiment, on the pattern on the collar is seen the name of the artist, and on her shoulder – year of painting – 1573. “Autumn” is completing the second half of the year and the summer. It is depicted in the image of a man whose head is sticking out of a broken pails. This head is a rough guy, consisting of lush autumn fruit: juicy pear – the nose, the cheek – a ripe apple, the chin – garnet, ear – large mushroom, hair – pink, red and dark blue grapes. And all reminiscent of Bacchus, god of wine, revelry and libations. The year ended, we can enjoy the fruits of their labors and have fun. 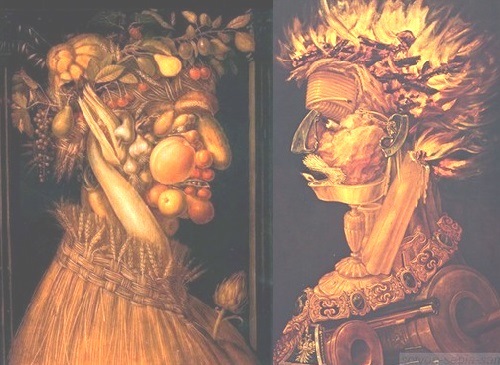 As a scholar and artist in one person, Arcimboldo compares the series “Seasons” and “Elements”, building a line between them and the kind of dialogue: winter – cold and wet as water; Spring – warm and humid as the air; summer – hot and dry like fire; autumn – cold and dry as the earth. Each pair (season-element) facing profile to each other: the summer and the fire, winter and water, fall and the earth, and the air – spring. This summer and fire – personify the sun, and autumn and the earth – the moon. Four elements are portrayed by the artist in the same anthropomorphic image, but the morphology of the images changes. They are woven from animals living in the respective elements: earth – from terrestrial animals: bull, deer, camels, lions, tigers, gazelles, dogs, monkeys, rhinos, bears, elephants, wild boar, etc . ; Air – from bird: eagle, peacock, duck, goose, turkey, rooster, etc . ; fire – of a different kind of fire from candles and lamps to guns and pistols, symbolizing the military power of the emperor. Water is represented by different types of marine animals that can not be listed. Here are shark and stingray, crabs and octopus, turtles and mussels, and even pearl adorning the neck and ears. No wonder that children are fond of the artist. To them, his paintings – always a game clue puzzles, and the pleasure of guessing. Because all the birds, animals, sea creatures are very realistic, ranging from painting and finishing with the shark teeth, although the size of some of the animals do not meet the reality. 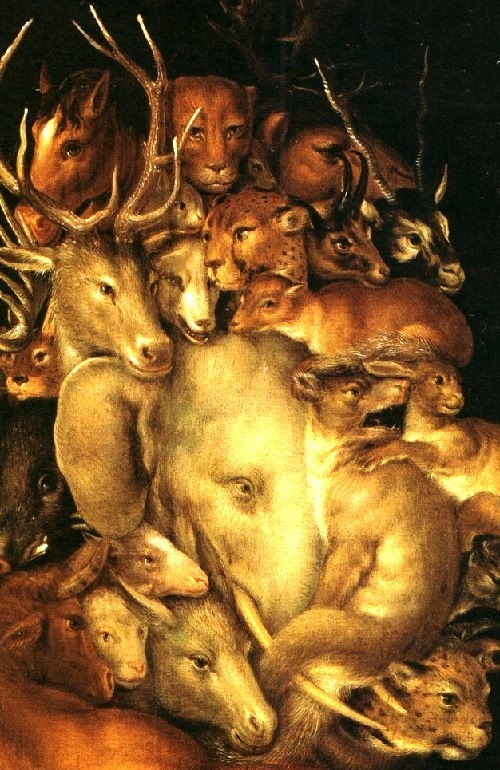 And most importantly – despite this diversity of living creatures in all the paintings of Arcimboldo there is no chaos, everything is thought out and there is harmony, a subordinate idea of ​​the artist. 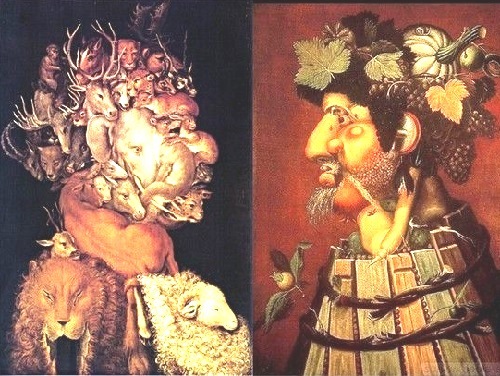 One of the most fascinating series of Arcimboldo – “Shifters”. At first glance – seems a basket of fruit, but upside down – a profile of a particular character. By the way, the artist himself was a very good gardener and knew what he painted. 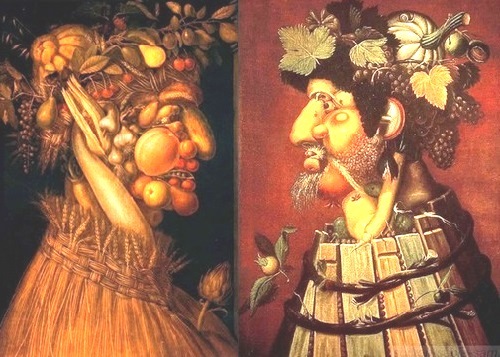 Today, some artists paint pictures made by Arcimboldo, but, in contrast to the classic paintings, they are really a series of jokes and funny things that do not carry any other meaning. 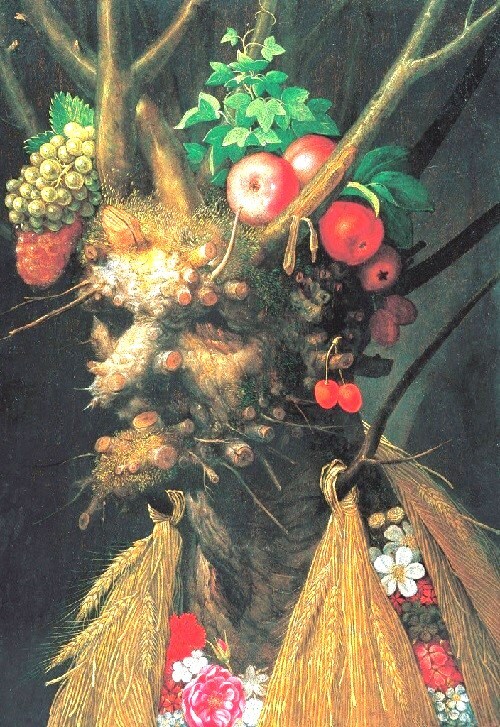 Giuseppe Arcimboldo was a scholar and philosopher, he tried in his own way to understand the world and to present it as he saw it. 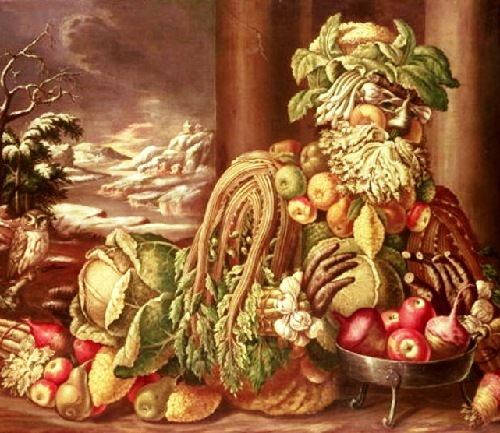 Arcimboldo was known as “Master of Feasts.” During the Renaissance at the courts of European monarchs he arranged holidays and tournaments – bright and festive, they had been long remembered by contemporaries. 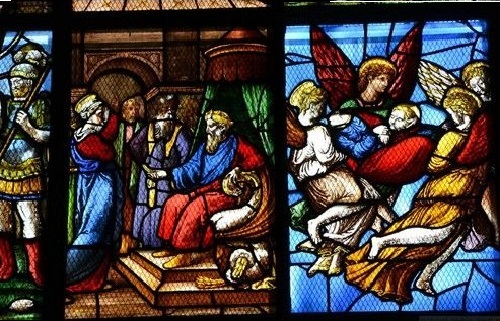 Scenes and characters for presentations were usually drawn from ancient history or mythology, the roles were played by members of the royal family, royal chamberlains and nobles. After serving 12 years at the court of Rudolf II, 60-year-old Arcimboldo asked about the resignation, and in 1587 returned to Milan. For “long, faithful and conscientious” service emperor granted the artist a half thousand Rhenish gilder. 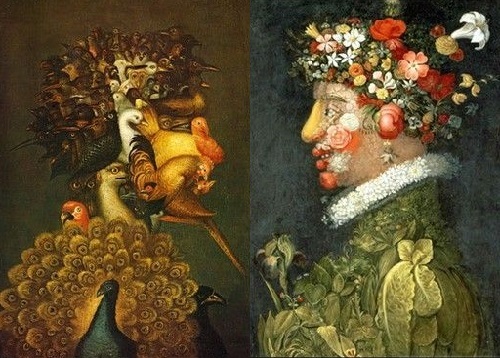 In 1591 the artist painted two of his most famous paintings – “Flora” and “Vertumn” and sent them to the emperor in Prague. 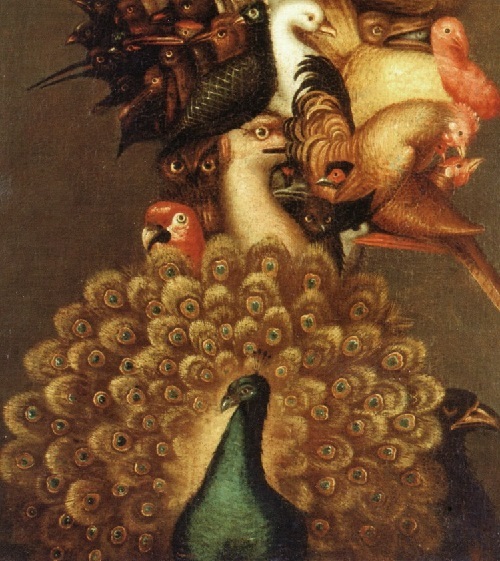 The paintings delighted him so much that Arcimboldo was bestowed the title of Count palatine. 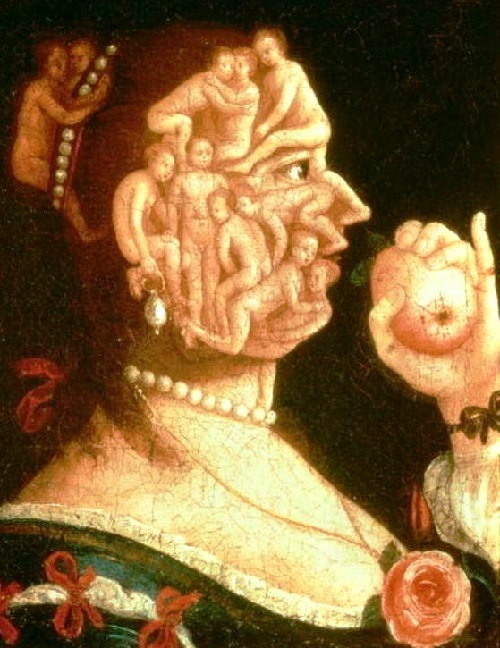 Arcimboldo died a year later.